In my perusal of myriad Peace Corps volunteer blogs, I read many posts describing puzzling cultural differences people encounter that are not serious enough to be explained in tech classes but still reinforce the gaps in experience and practice that exist between Americans and everyone else. I find them interesting – and many times entertaining – so I thought I would start a list of my own. Time is valued. It should be used productively. Schedules are kept and followed. It is rude to be late for an appointment. Deadlines are expected to be met. Time is flexible. Schedules may be made but not followed. Meetings are often planned or canceled at the last minute. People often arrive late for appointments. Deadlines are a suggestion. Change is seen as a positive challenge. Initiative and free enterprise are encouraged. Mobility is commonplace. People travel miles to work, change jobs often. Living or moving a lengthy distance from one’s family is not unusual. Change is often seen as risky and stressful. New things are regarded with suspicion and uncertainty. Traditions are positive and celebrated. Moving far from one’s family is only done when required to obtain work. The “American Dream” is defined by the ability to affect one’s destiny. Events in one’s life are often linked to fate and superstition. Social and business environments tend to be informal and relaxed. People usually address each other by first name. Directness and informality are highly dependent on context and familiarity. In business and educational environments, people are usually addressed by title. Independence is highly regarded. Most young adults and families establish their own households as soon as they can afford to do so. Family is centralized when possible. Many young families live with parents and the youngest child usually stays with them all of his or her life. Privacy is a positive condition and personal space is valued. Isolation indicates depression. People prefer to spend time in one another’s company. So the above is probably relatively self-evident to anyone with a passing knowledge of Soviet-era mentality and ethnic groups that have tended to live in agrarian communities. But then there are things that one runs across that are not so easily understood or maybe they relate to the above attitudes and views but one must dig through the surface oddity to grasp the connection. 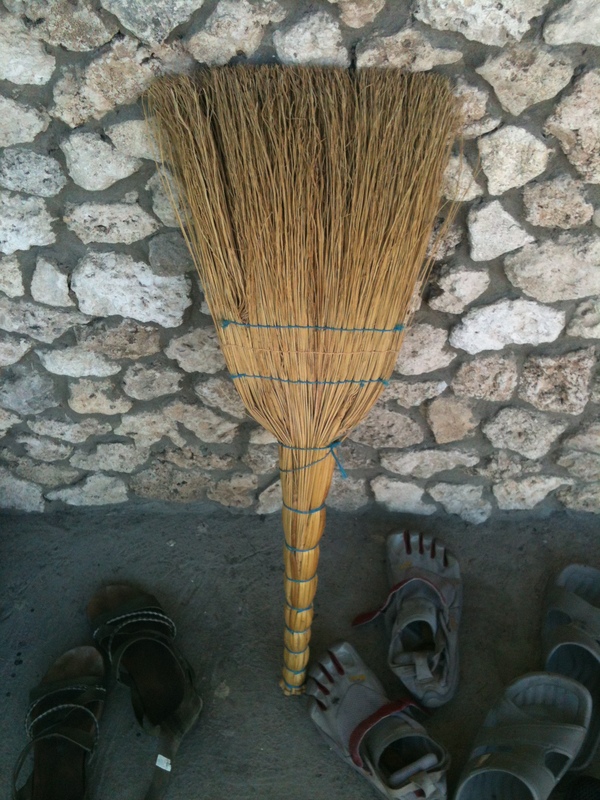 Everyone uses these brooms in Moldova. Both women and men use them in the city, in the villages, in their homes and offices and schools to sweep the floors, inside and out. I watched a woman at the center I will be working at spend an hour – literally – hunched over like a peripatetic question mark sweeping the grounds where the children would play. My question? Why oh why wouldn’t one lengthen the stalk so it would be possible to sweep in an erect position? Why bend over in a way that must become uncomfortable after 10 or 15 minutes when you sweep the floor every day? I wanted to grab the damn thing and tie it to a branch or pole and show her how much easier the task could be. Someone could make a fortune marketing American brooms here. The broom thing is hilarious. Another is the almost pathological mistrust of any device which cools or circulates the air, like an air conditioner or fan. I’ve held myself back on several occasions from screaming “moving air is not harmful, people. After all, its still just AIR!” Your blog is great, Yvette. Emmersing yourself in the true cultural experience in every sense….perhaps there is something very important about the bending and tending with the broom and the time and attention given to it. It is something that is done regularly and individually. While tradition is clearly followed and treasured – could there be anything else to it? It is kinda like when I tend my flowers, it is easier on my back and knees to stand…but when I kneel down and really bend and move down into the earth and its level do I see it from its own perspective…it can be an interesting and enlightening view. It also becomes a very spritual experience. I would encourarage you to sweep the floor – and I really want one of those brooms – it is AWESOME! I could carry them in my new store as a spiritual tool – (WOW – can you tell that I have been meditating this morning? LOL). Inviting wisdom and spiritual guidance to the table, as always! It reminds me of what I hear so often from those who live and work in different countries: Quality of life is better in a European country, but if you want to succeed in any business endeavor, move to America. Apparently, these people don’t sweep. I think Moldovan people’s attitude towards time is interesting, and oh so different than their American counterparts’. I wonder how this attitude is embedded in their larger philosophy of life? How does this view of time affect their perception of the world around them? I know that time is always present in my mind. I never lose sight of it. It constantly occupies a space in my consciousness. I think its interesting how, even without a clock handy, most Americans can guess approximately what time it is. This, I think, is because they are always keeping track, even if they don’t realize it. I am sure, though, that all of us have also experienced that profound feeling when, just for a moment, time escapes us and we lose ourselves in a thought or activity. This is why you are so lucky to be where you are, Mommy, you get to lose yourself in this culture and experience these differences in perception firsthand. Greetings from the Peace Corps’ Office of Third Goal and Returned Volunteer Services! Thank you for sharing your experience with cultural differences in Moldova. Your discussion and comparison of Moldovan views vs. American views on various cultural values is very interesting and directly supports the Third Goal, to help Americans better understand the cultures of other countries. Keep up the good work! I am thinking that all the things on the American list are exactly what made it possible for you to be in Moldovia so that you could learn to use that different kind of broom!